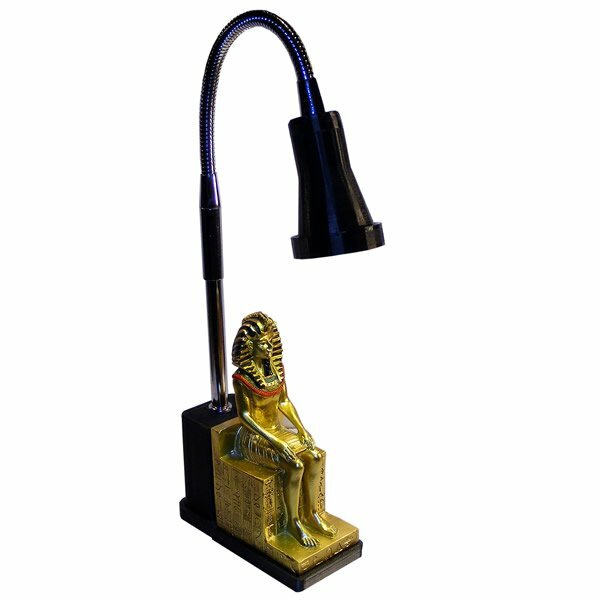 A novelty bedside lamp with Pharaoh Rameses seated on his throne under a chrome gooseneck lamp with a convenient on/off switch on the column behind the lamp. The ornament of Rameses is cast in resin and hand painted in bright gold, black and red, colours associated with ancient Egyptian imagery. The overall height of the lamp is approximately 29cm (as shown in the photos) but this depends on how you shape the adjustable gooseneck section at the top. Overall dimensions of the lamp base, approximately 5.2cm wide and 11cm front to back, the ornament of Rameses itself is 13cm high.